…Or maybe it doesn’t. I’m sure that you can find someone on Reddit that will swear up and down that they and a friend tried some in Europe, and some “super freaky” stuff happened. There are also the tales we heard in college where a cousin of a friend of a friend smuggled some in and had a bad trip where he ended up in a mental institution. Movies like Moulin Rouge with the green absinthe fairy scene don’t do anything to dissuade people from buying into this weird reputation of absinthe being the LSD of liquors. However, the truth is far less psychedelic. Absinthe does, in fact, have an ingredient called wormwood (Artemisia absinthium), which makes up the thujone that gives absinthe its signature character, and can cause hallucinations in large enough doses. The key here is "in large enough doses." Absinthe made in the US is only allowed to have ten parts of thujone per million, max. That means a person would have to drink so much absinthe that they'd die from alcohol poisoning long before they started tripping. This truth didn’t do anything to save the Green Lady from getting banned though. The US banned absinthe in 1912 due to a highly successful smear campaign that falsely claimed that the drink was hallucinogenic. If there was a social ill, it could be laid at the feet of absinthe. A gullible populace bought the lie hook, line, and sinker. Remember that there were enough idiots to get Prohibition started just a few short years later. Absinthe remained illegal for nearly a century before it was made legal again in 2007. 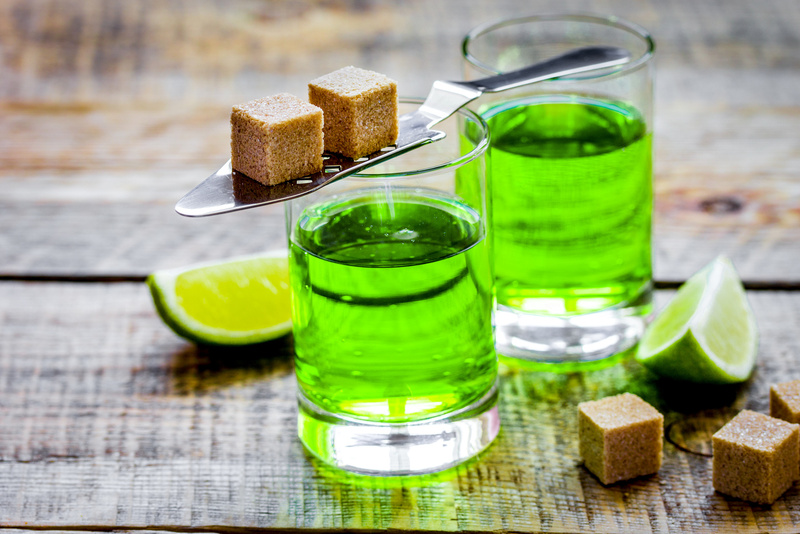 Within the past thirty years or so, absinthe has gained a certain level of popularity and notoriety. It isn’t exactly a fixture of pop-culture, but more pop-subculture. As best I can tell, it gained a bit of its romanticism in the goth culture of the late 80’s/ early 90’s, where a ghostly green liquor popular with past Parisian artists that makes one see spirits goes well with a serving of goth, and grew from there. All of it somewhat fueled by the above tales of adventures abroad and altered mental states that opened new worlds to the drinker. Now we see it pop up in movies and video games, which puts it on more people’s radar. The supposed mind-altering (beyond that of alcohol) effects are usually the first thing people find out about. And so, the misleading reputation continues. That being said, there will always be those who claim to have had hallucinations from drinking it. I chalk it up to placebo. People can get themselves psyched up to believe almost anything. I remember thinking that I was drinking my morning coffee once, only to realize that I forgot actually to put coffee in the coffee maker. I had drunk half a cup of hot water, thinking it was the morning key to existence before realizing what I had done. Absinthe works the same way. Just like in high school when we pranked someone by giving them non-alcoholic beer and watching them get “drunk.” People will drink absinthe and have hallucinations because that’s what they are expecting, and probably always will.